I got really excited when I read this the first time. I dreamed of a Grave Pact effect that could extend to all sorts of permanents. Using a Planeswalker’s ultimate ability would get rid of opposing Planeswalkers. Artifacts and enchantments could be sacrificed for good effect. That is magical Christmas land. If someone wants to trade you for this at $2 then I say jump at it. It is too expensive and unreliable unless you build combos around it. You could usually just use Planar Cleansing to get the desired effect without all of the work. The name is generic enough that this could show up in any set. I think the honeymoon is over. It is a rare from an old set on the reserve list. It has a massive impact in multiplayer games and it currently buylists for $0.24 more than you can buy it for. I would grab as many $2 copies as you could find before everyone updates the price to $4. He is a great budget Commander from a set that was printed long ago. He has an interesting effect and works well with other Commanders has well. His flavor makes him difficult to reprint outside of supplemental products. He can still be found for $1.48 and Buylists for almost $2. I really cannot make a better recommendation than that. Remember he is insane as a build around me or as the Commander for a Shadowborn Apostle decks. The Apostles will be rotating soon. I would look to grab as many as you can find if they dip in price. Every time I read this card I want to play it with Stuffy Doll and Mogg Maniac. All of the original Commanders are being targeted due to scarcity and growth in the interest in the format. She can get you cards, play as repeatable removal and is one of the many cards that is only better with Nekusar. Due to only using two instead of three colors she is easier to reprint as Basandra, Battle Seraph has shown us in Conspiracy. Nin, the Pain Artist is still priced to move. I would look at Ruhan of the Fomori and Zedruu the Greathearted for other cheap Commanders with room to grow. This is an excellent Commander card. You always have a Legendary creature ready to equip it that shares a color with every other creature in your deck. Even with a minor tribal thing this can be very helpful. This has been growing slowly but steadily until recently. It is difficult to reprint outside of a supplemental product because its name is tied to a character on a very unpopular plane. This is something I would be glad to have in my trade binder. There is a negative spread on this which is an excellent opportunity for arbitrage or aggressive growth in the near future. Courser of Kruphix has been making its mark on Standard and Legacy. Courser and Domri Rade or Archangel of Thune can make for some exciting turns. It has also been played to good effect in Modern Jund decks. This is part of what has pushed it to the next level. It requires a heavy commitment to green or excellent mana fixing so I think it will definitely surpass $15 but I don’t think it will hit the $20 mark without some serious help from M15. Born of the Gods will not be drafted as heavily as normal with Conspiracy being such a hyped event. I think this will help Courser of Kruphix. I would sell into the hype just after it crests $15. You make not make all of the money but if you got these in a draft or back when these were $5 to $6 you should be sitting pretty. I would hold onto foils for Modern as those keep their value better. What can I say about a card so powerful it was the subject of an emergency ban mere weeks after it was printed? It is somehow so broken that it made it into From the Vault: Relics despite being on the reserved list. It is restricted in Vintage but for is legal in Commander. It is completely insane in normal situations but when you make each player draw seven cards Nekusar the Mindrazer starts salivating. This no longer enables crazy combos. Now it enables widespread death and destruction. Many players of MTGO will be giving this card a spin as part of Vintage Masters and that can only enhance interested. I don’t think you can lose trading for these. They will always have a home in Cubes and Vintage. This little known rare from Visions is on the reserved list. Most people (myself included) did not even remember that it exists. It is excellent for a Nekusar the Mindrazer Commander deck but also works in other Dimir or Grixis Control decks. It has only started getting attention and some places still have it listed below dollar. Others have it as $2 on its way to $3. It currently has a negative spread meaning some Buylists are paying more than the lowest price you can purchase it at. We have already seen Nekusar cause rises in price in a number of rares and this one can still be found cheap. I would suggest striking while the iron is hot. Manaless Dredge continues to be one of the most affordable ways to give Legacy a try. It works on a completely different axis as most decks. Instead of generating card advantage through drawing cards it actively tries to mill its entire deck then Dredge Return a Flayer of the Hatebound in a gigantic Golgari Grave-Troll. It has some ways to fight through traditional graveyard hate like Deathrite Shaman and makes your opponents Wastelands look like a joke. Nether Shadow and an ever increasing graveyard make playing cards like Cabal Therapy and Dread Return easy to do. I expect all of the cheaper components of the deck to continue to rise as this deck catches on. The deck plays a lot of commons, uncommon and budget rares. I would grab some cheap foils like Flayer of the Hatebound and Balustrade Spy. Their effects are essential to the deck and difficult to replace. When you are building a Cube or making a Commander deck you want powerful and unique cards that jump out and make a splash. There are few ways to shift the momentum of a game than to wipe the board and load up your hand at the same time. Both of these formats love their foil cards and there are only two ways to get your fix. You can get the original Scourge foil or for a third the cost you can get the new artwork from Commander’s Arsenal. I had discounted this card because of the amount of copies flooding the market from the Mind Seize Commander 2013 deck. They were not foil but they were exerting a lot of downward pressure on the existing copies. Once players get into the format after tinkering with their ninety eight card decks they want to start pimping their decks. When they do this will be the copy they target. I see this one continuing to climb. There are still some other targets from Commander’s Arsenal that are available at low costs. 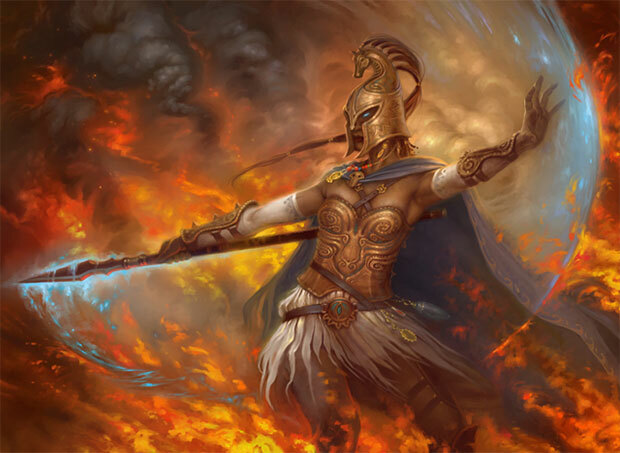 I am looking at possible Commanders Vela the Night-Clad, Diaochan, Artful Beauty and Edric, Spymaster of Trest which has been seeing some Legacy play and has come down considerably recently. Last week I said the only foil copy of this card was the one from From the Vault: Exiled. Several readers kept me honest by reminding me that the Deckmasters copy has the original art and is one of the few foils printed in that set. Thank you readers! This card was recently reprinted online in Vintage Masters. It is a great candidate for any monoblack build in Cube or Commander. It is restricted in Vintage but any casual deck will welcome it through the end of time. I see this as a hiccup. It is a part of Magic’s history as well as being completely broken. This will always be a safe buy and hold. Mutavault has been one of the most played cards its entire time in Standard. It was around $33 before it was reprinted in M14 and I think that price memory counts for a lot. It is still used in several Modern decks including Merfolk, Faeries and others. I don’t think it will have quite as rocky a road as most cards do upon rotation but I think picking them up at $15 to $20 around rotation is quite realistic. Anyone who plays Standard but not Modern will probably be trying to get these out of their binders soon. This could be a good opportunity for someone who is willing to wait a few years for prices to get above $30 again. This rare is played a surprise in Legacy decks like Sneak and Show and Cephalid Breakfast. Your LGS is about to get an influx of them as Conspiracy is drafted. I expect the original foils to retain most of their value but I suspect the regular printing will be taking a bath. I would move them sooner rather than later. Domri Rade still has some fight in him. As mentioned above he is best friends with Courser of Kruphix. They two together provide a stream of card advantage. His time in Standard is coming to an end. He has not seen much adoption in Modern yet. He is a strong planeswalker and will always retain some casual appeal but I expect him to dip below $10 in the coming months. I would get rid of him. True-Name Nemesis was recently featured in the winning deck in the SCG Somerset Legacy Open. There were ten out of a possible thirty two copies in the Top 8 alone. It’s been a rough month for the fish. The first reason is simple supply and demand. Stores can order two copies of Mind Seize for and three other Commander 2013 decks instead of just one of each. Wizards has made Mind Seize a box full of value but it is no longer a $20 bill sitting on the shelf that leaves you with ninety eight free cards. The second reason is that Conspiracy has announced card called Council’s Judgement which can just exile him despite protection, shroud or hexproof. For the price of an Oblivion Ring you can vote for any nonland permanent and exile it in a duel. I expect it to shake up the Legacy metagame. True-Name Nemesis is still a strong player but the invulnerable just became vulnerable. The $40 days are over. I expect it to settle around $15 to $20 depending on the metagame. Council’s Judgement is forcing you to double W.
I mean, you have and had Runed Halo for WW for a while that I think is quite better than WOC. Did not matter that much. Geez. With all this talk about Nekusar decks and cards being so popular, you’d think picking up Nekusar himself would be a good investment? I mean, buddy had trouble moving all those Ghaves but Nekusar might be more popular? Donor really caught my attention. Will wait for a couple more weeks and buy some. I think he is very good planeswalker and we will see similar trend as what we saw on Tamiyo from Innistrad block.